Nobody knows for sure, but we estimate that 10s of millions of fish have been caught on 'The Whip' and its cousins. Read below to see how it all started. The history of "The Whip" goes back to the early 1950's. The perch fishing on the shores of Lake Michigan is southeastern Wisconsin was at its peak. Catching 100 perch a day was common but you could easily burn 10 dozen minnows or worms in the process. A few fisherman started using strips of opaque white rubber they cut themselves. It worked pretty good and was certainly cheaper than buying all that bait. When the perch fishery collapsed in the mid-1950s, the rubber slivers were all but forgotten. Sometime after that the Chena-Bait (baby seal skin?) fad came and went. A similar situation happened in the Green Lake, WI area. On one particularly slow day there was a Vietnamese woman that was pounding the bluegills when nobody else was. A fellow approached the woman to see what she was fishing with. The woman was using strips of rubber that she had cut from an old set of dishwashing gloves. In the mid 1970s the plastic worm revolution, "texas rigging", and the inventions of the "Mister Twister" had turned the concept of jigging on its head. Jigging twister tails in Canada would produce an catch of walleyes faster and more conveniently than live bait could. 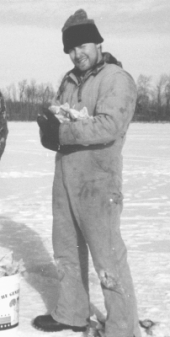 Ice fishing was catching on too with the advent of modern hand and power augers that made cutting a hole in the ice really easy. Lake Mendota in Madison, WI was one of the most popular lakes for panfish. Many fisherman from southern Wisconsin flocked to get 50 fish limits of perch, bluegill, and crappies. Wax worms worked but they were hard to come by. You couldn't just stop at the quick-e-mart and pick up a dozen. Many raised or harvested their own waxies and grubs, but it was a lot of work and they died and turned black if they got too cold. A chance encounter between one of the innovative Lake Michigan perch fisherman and a fisherman named Herman, one day out on Lake Mendota, was the inspiration for a soft plastic ice fishing tail. Herman was using thin slices of purple bass jelly worms on a #8 ice jig and doing quite well will all species of panfish. Fishermen Joe Moreau and Oscar Franseen from Racine, WI started cutting their own slivers of purple worm and calling them "Purple Hermans". The "Purple Hermans" worked great and a few ice fisherman swore they would never use live bait again. As the demand for the tails grew within the circle of friends, cutting the jelly worms into the perfect shape was getting to be too time consuming. Looking for an easier way, it was soon realized the plastic used in the jelly bass worms could be re-melted. An open face mold brass mold was made with a file. The evolution from strips of rubber to molded soft platic was just about complete. Unfortunately, the pointy tail that gave the tail its perpetual wiggle, couldn't be made reliably with an open face mold. An acquaintance of Joe and Oscar, Cy Quella, had a son that had a machine shop and they had him mill a 2-piece injection mold. Thousands of 1" plastic tails were pressed from this mold. Before long control and ownership of the mold became an issue. They parted ways with Cy, and Joe had a large mold machined that pressed 1.25" tails. Joe cut the mold in half and shared it with Oscar who retired up in Burnett County, WI. Cy kept the 1" mold and sold his own tail calling them the "Small Fry" and we believe these are the same tails supplied to HT Enterprises. Joe supplied his tails to Reinke Brothers in Milwaukee. Today HT still sells this same shaped plastic tail under the "Micro Softie Tails" name. Reinke Bros. also sells this plastic tail under the name "Ice Slivers". Joe Moreau, now "Plastic Joe" was selling heavily around the Madison area as well as the lake Poygan and Fremont areas. Plastic Joe also sold out on the ice and always had a bucket of line-through-the-blank fishing poles that he sells as well. "Plastic Joe" Moreau continues to sell his tails and rods from his place in Racine (call first before stopping by). In the 1990s, a few other "entrepreneurs" copied the tails they purchased from Plastic Joe and started selling under various names like PinPoint Plastix or Hawks Panfish Plastics. The "Wedgee" by Little Atom Lures is slightly thinner and has 4 sides instead of 3. We started using tails pressed from Joe and Oscars original mold in the late 1980s. We had great success with it but wanted a slightly longer tail for jumbo perch and late ice crappies, but could also be cut down for a lite bite. We had a new 1.75" mold machined in Boyceville, WI. We experimented and tested softer plastics and scents until we had it perfected. The result is a longer tail with a long taper that created an extremly sharp point. We call this super soft plastic tail "The Whip" because of the incredible live flicking action that seems to come alive without even trying to jig it. The pulse of your thumb on your jigging pole, or a slight breeze on your fishing line is enough movement to keep The Whip whipping. The evolution of The Whip has spanned 4 decades. The shape, the soft translucent plastic infused with SL-B, and the protective anise scented sheen are some of the improvements over the years, that have made The Whip the best bait, live or artificial, ever dropped below the ice. You have got to try 'em out. The Whip is manufactured in Chippewa Falls and Boyceville, WI. We have been selling online since 2007 to bring this innovation to all corners of the earth with frozen lakes. We welcome all feedback and look forward to hearing from you. Click here for a complete product listing. 1.75" super soft plastic ice fishing tail/bait. Packaged in a small zip-loc bag and lubricated with an Anise scented oil. Click here for smaller quantities and more colors. Satisfaction Guarantee: We are very proud of The Whip and personally use it exclusively. If you are not completely satisfied with your purchase, simply return it for a full refund of the purchase price!